This is an archived copy of the old 'Amityville Truth' website from 2003 - the precursor of George Lutz' official Amityville Horror site. Some slight alterations have been made and some new material has been added. 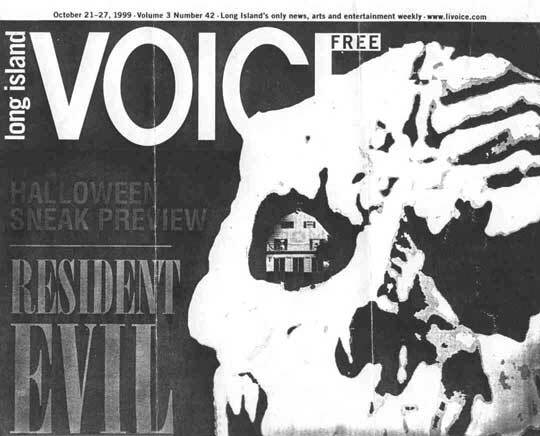 Acclaimed radio host Shadoe Steele explores the Amityville legend. This two volume CD set contains exclusive interviews with George Lutz, Tracey Defeo, Hans Holzer, Lorraine Warren, Laura DiDio and Mary Pascarella Downey. In Dallas, Texas, while Attending HauntCon 2005, Mr. John Clontz of the Deadly Shoals Haunted Trail was reviewing a few historic photographs, including this one, taken of the Amityville house just days after the DeFeo murders went down. Something in this picture caught his eye. Is there more here than just a photograph of the notorious house? All we ask is that you examine it for yourelf. Mr. Lutz has filed suit in Los Angeles County Superior Court, claiming he's been libeled by the recent movie remake of "The Amityville Horror." Lutz filed suit June 10th, against Dimension Films, Metro-Goldwyn-Mayer and others, including two screen writers. 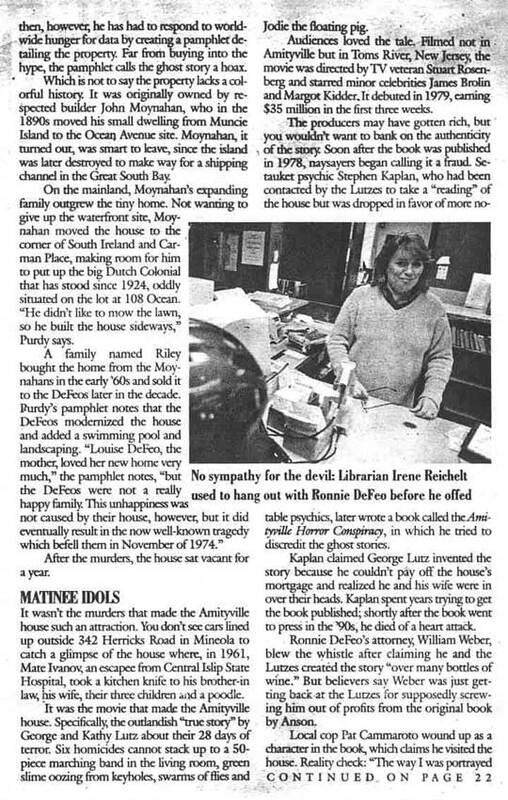 • L.A. Times article, "Amityville Remake Disturbs His Spirits"
Mr. George Lutz recently appeared on MagickMind radio, discussing some of the unusual photographic anomalies that have appeared in photographs of the house on Ocean Ave. Click on the link to be taken to their site where you can hear the interview in their archives section. Jodie doesn't like George... and neither does MGM. Among other things, this interview discusses a few 'surprises' held within the framework of the new Amityville Horror remake . Trust us, though, it won't ruin your enjoyment any more or any less if you read this article first. In fact, we strongly recommend that you do read this interview before buying a ticket. Ryan Rotten from horrorchannel.com sits down for an interview with Dan Farrands, to discuss his account of the events leading up to the 2005 'Amityville Horror' motion picture remake. An important article! Some claim this crime scene photograph is evidence that the DeFeos were awake at the time of their deaths -- not shot in their beds. But what does it really show? This new analysis questions if the photograph was even taken inside the DeFeo house. A 2001 Ebay auction where the supposed son of Ronnie DeFeo (or so he claims) tried to make money off of letters between Ronnie Defeo and his wife. Geraldine Gates claims she married killer Ronnie DeFeo in 1974. This official document verifies that there is no record of their marriage in 1974. More in a growing pile of evidence showing Ric Osuna's star witness to be a fraud. Radio talk show host Lou Gentile contacted Ronald DeFeo Jr. in prison concerning the murders, and Ric Osuna's claims. Ronald DeFeo Jr. wrote Lou Gentile back, and here is the transcribed letter. 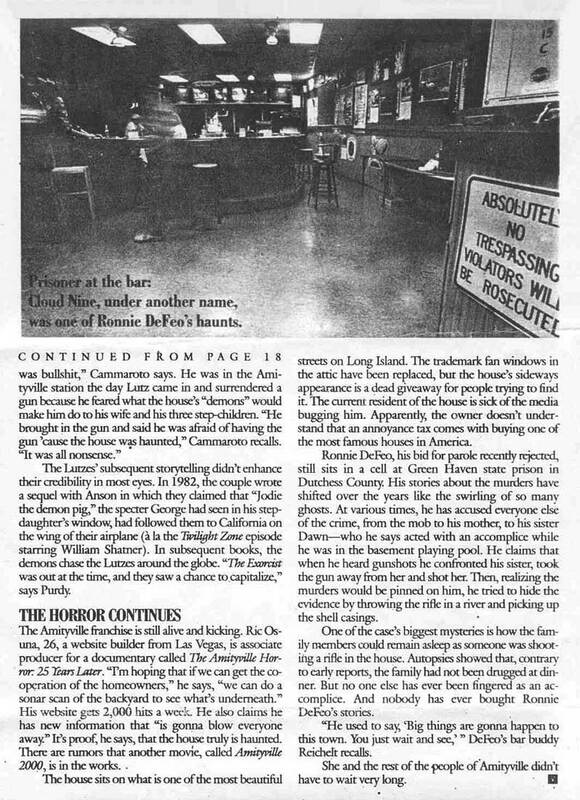 'Long Island Voice' article from 1999 featuring an article on the 25th anniversary of the DeFeo murders (and the later haunting). On Page 3, Ric Osuna is quoted as saying he has proof 'that the house is truly haunted.' Less than a year later, Ric would be telling people he had proof that it was all a hoax. A scanned letter from Ric Osuna to Kathy Lutz sent just months before Ric's flip flop. Really illustrates just how sudden Ric's change of heart took place. The letter contains information concerning Ric's involvement in representing Kathy and George's movie rights. Does this photograph show a mysterious 7th victim in the DeFeo home? Some think so, claiming this is evidence of misconduct by the police who framed Ronnie DeFeo for the slaughter of his own family. But like the 'Bloody Shoe Photograph mentioned above, here we present evidence that this photograph seems to have come from an entirely different crime scene. WARNING: Page contains a graphic photo of a dead child. Ed and Lorraine Warren have been helping people to understand, cope with and overcome violent hauntings since the 1940's. They were the principal investigators called into the Amityville home, and their website has fascinating information regarding the haunting that occurred at Amityville.